PTI, NANS agree on tuition fee reduction – Royal Times of Nigeria. 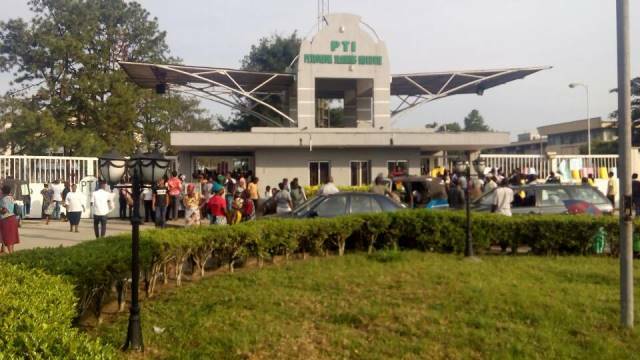 The National Association of Nigeria Students (NANS) has resolved the stand-off between it and the management of the Petroleum Training Institute (PTI), Effurun, Delta over tuition fee increase. NANS president, Mr Chinonso Obasi, led some executive members of the association to engage the management of PTI in a constructive dialogue inside the institution’s premises on Tuesday. NANS had on Monday issued a 24-hour ultimatum to PTI’s management to reverse the approved schedule of charges for 2017/2018 academic year in which tuition fee was increased by 130 per cent. The dialogue which commenced in the morning lasted until night before the management led by the PTI Principal, Prof. Sunny Iyuke agreed to shift ground. Iyuke said that the institution was underfunded and needed to execute a lot of projects. “The school fee has increased because the costs of things have also risen. Four years ago, we were paying N14,000 as school fee but things have changed. “We want to provide quality education for our students; this proposed fee is just an initial; we should be realistic. “We need funding to be able to justify the purpose for which PTI was established,” he said. The Professor of Chemical and Process Engineering who was appointed in July 2016 said that the institution was operating on loans. Obasi said that the previous fee for General Welding was N51,000, ND 1, N42,000 and HND 1, N43,000. He said that the management increased the tuition for General Welding to N115, 800, ND 1, N99, 800 and HND 1, N103, 800. The NANS president said that after the dialogue, the PTI management agreed to shift ground by slashing down the fee to N81, 600 for General Welding, N67, 200 for ND 1 and N68, 800 for HND 1. “We came to PTI upon 24- hour ultimatum given to the management to give an unconditional reversal in the tuition fee that was increased and the management quickly invited us for a dialogue. “There was about 130 per cent increment and we have been able to bring it down to 60 per cent in the sense that the institution is underfunded. “It is a pity that a national asset like this has been abandoned by the Federal Government. “We have agreed to partner the institution to see how we can generate more funds from other sources for the institution,” he said. Obasi appealed to the institution’s management to always create the enabling environment to dialogue with students on issues. He also advised the students to take their academic work seriously assuring that the association would continue to negotiate and dialogue on their behalf. In the course of the deliberation, a minute silent was observed to mark the one- month-old burial of late Mr Dauda Mohammed, former NANS president, 2011/2012.